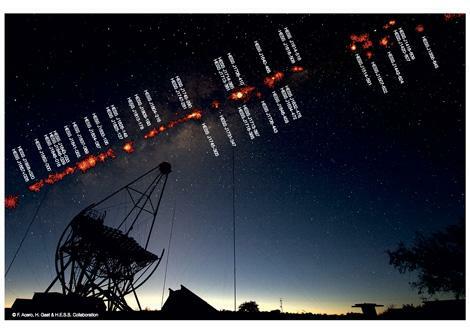 The HESS international collaboration, to which CNRS and CEA contribute, has published the results of fifteen years of gamma ray observations of the Milky Way. Its telescopes installed in Namibia have studied populations of pulsar wind nebulae and supernova remnants, as well as microquasars, never before detected in gamma rays. These studies are supplemented by precise measurements such as those of the diffuse emission at the center of our Galaxy. The entire set of data will henceforth serve as a reference for the international scientific community. Fourteen articles, making up the largest ever set of scientific results in this field, are published on April 9, 2018 in a special issue of the journal Astronomy & Astrophysics. In the Universe, cosmic ray particles are accelerated by galaxy clusters, supernovae, binary stars, pulsars and certain types of supermassive black holes. Through a still poorly understood mechanism, they attain very high energies, made visible by the emission of gamma rays. When these gamma rays reach the Earth's atmosphere they are absorbed, producing a short-lived shower of secondary particles that emit weak flashes of bluish light known as Cherenkov radiation, lasting just a few billionths of a second. It was in order to detect these extremely short flashes, and hence gamma-ray emissions, that fourteen countries set up the HESS array(1), the world's largest gamma-ray observatory, in Namibia in 2002. The large mirrors of its five telescopes collect Cherenkov radiation and reflect it onto extremely sensitive cameras. Each image provides the direction of arrival of a gamma-ray photon, while the amount of light collected provides information about its energy. By building up images photon by photon, HESS can thus map astronomical objects in gamma rays. In spring 2003, the center of our Galaxy and the remnants of the explosion of a massive star were the first two sources identified by HESS's Cherenkov telescopes, then still being tested. Since then, in 2700 hours of observation time, the HESS array has continuously explored the Galaxy and discovered many other sources and types of source of gamma rays, extending ever further the field of ground-based gamma-ray astronomy. Its five telescopes have identified exactly 78 cosmic sources emitting very high energy (VHE) gamma rays, more than all the world's other observatories combined. The HESS Galactic Plane Survey (HGPS) catalog released today, four times larger than the previous one dating from 2006, will be of great value to the entire astrophysics community, who will for the first time be able to access a very high energy gamma ray data set of this size. It provides an overview of fifteen years of research that has successfully characterized the most abundant types of gamma ray sources, such as pulsar wind nebulae and supernova remnants, and made detailed measurements of individual sources as well as of entire regions of the Milky Way. HESS has also revealed in detail the accelerators of particles that underlie these sources, and how cosmic rays travel through the interstellar medium and shape their environment. In addition, HESS has detected emissions from new classes of objects emitting very high energy gamma rays, such as stellar-mass black holes orbiting massive stars, and has characterized the absence of emissions from other classes of objects such as rapidly moving stars. HESS's results are remarkable, showing that very high energy gamma ray astronomy has reached maturity. The HESS collaboration has already been awarded the European Commission's Descartes Prize in 2006, and the Rossi Prize of the American Astronomical Society (AAS) in 2010. A survey published in 2009 included HESS among the world's ten most influential astronomical observatories(2). The entire gamma-ray astronomy community is currently preparing HESS's successor, the Cherenkov Telescope Array (CTA), a planned observatory that will be even more sensitive and based at two sites, one in the northern hemisphere and the other in the southern hemisphere. However, until the CTA becomes operational in the 2020s, HESS's findings published today will be used for the CTA's observation strategy, and will remain the reference in gamma-ray astronomy. Laboratoire Univers et Théories (Observatoire de Paris/CNRS/Université Paris Diderot). France is also already committed to the CTA project. (3) Germany, France, Namibia, South Africa, Ireland, Armenia, Poland, Australia, Austria, Sweden, United Kingdom, Netherlands, Japan.